Engagership: Stop leading. Start engaging. Since the 1980s, there’s been constant discussion about the difference between a manager and a leader. Both are needed, but the consistent message has been that a great leader – one who is charismatic, visionary, and excellent at making decisions – is the key to results. As I’ve written before, traditional leadership no longer produces superior results. An organization needs both, of course. Good management is critical to quality, customer service, and profitability. Good leadership is key to effective strategy, decisions, and alignment. In other words, management and leadership have become table stakes. Today, what sets apart the extraordinary is engagership: stimulating, unleashing, and focusing the collective talent and passion of the team. It’s beyond managing or leading; it’s cultivating a team to serve a shared purpose that they define and shape together. This is the connected economy, where ideas are changing everything quickly. It’s the era of social media, crowdsourcing, and viral videos. Startups like Google and Facebook come out of nowhere and take over; huge companies like Lehman Brothers disappear overnight. No sooner is a decision made, a goal defined, a destination targeted, a map drawn, then the circumstances change. A new map must be drawn. “No plan survives contact with the enemy,” said Helmuth Karl Bernhard Graf von Moltke, one of history’s most famous military strategists. Has this ever been more true than today? “I have always found that plans are useless,” said Dwight Eisenhower. “But planning is indispensable.” Planning is still important for many reasons, such as focusing energy and improving processes, but today’s environment requires responsive, agile planning and implementation. Top-down planning and cascading is too slow and narrow. In a world that’s complex and rapidly changing, it’s too limiting to relegate so much responsibility to a person or committee. 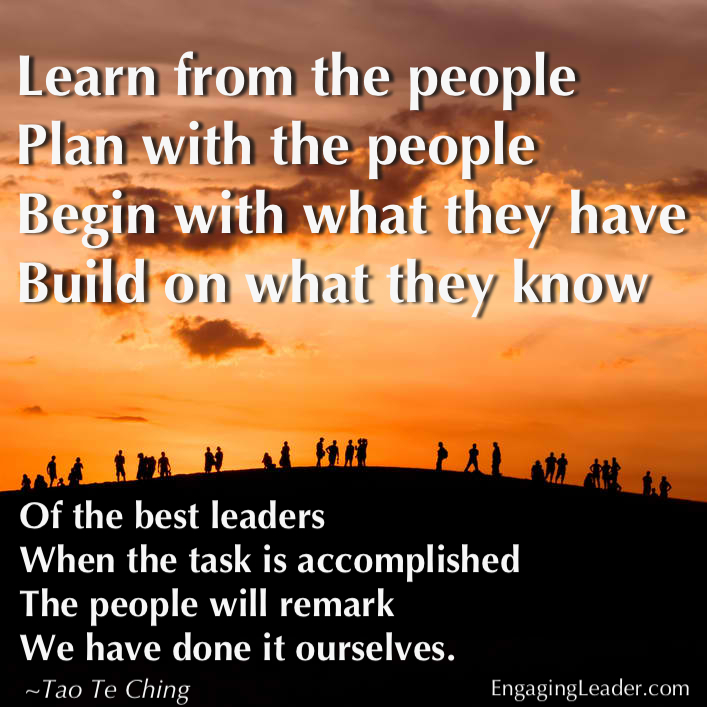 “Learn from the people,” says the Tao Te Ching. “Plan with the people.” These ancient words from a slower time reveal a secret weapon for this day of rapid change. In his bestselling book DRIVE, Daniel Pink builds a convincing case that today’s workforce is motivated by three things: autonomy, mastery, and purpose. “Autonomy” is a fancy term for a concept near and dear to Americans and many others around the world: freedom. Freedom in our work means having a significant degree of choice in what we do, how we do it, and when we do it. Does that sound like we want to be managed or led? “Purpose” means contributing to something that makes a difference in people’s lives. People don’t stay engaged for very long for the sake of a paycheck or a product. Winning companies engage their people in exploring the higher good their team can accomplish. They constantly remind people of their shared purpose and stimulate them to continually shape the purpose over time. We no longer want someone to lead us. We want someone to help us lead ourselves, together. If you haven’t noticed, communication has changed since 1989. Heck, it’s changing as I write this. There are the obvious technological changes. From letters and faxes, to email and web, to forum and blog, to Facebook and Twitter, to Vine and Pinterest, to whatever is trending when I finally publish this article. Stimulates honest dialogue and critical thinking, rather than polarized spin, ad hominem attacks, and twaddle (brain candy). These trends affect all types of communication … organizational and interpersonal; written, oral, and visual; instructional, practical, and even entertaining communication such as music and movies. 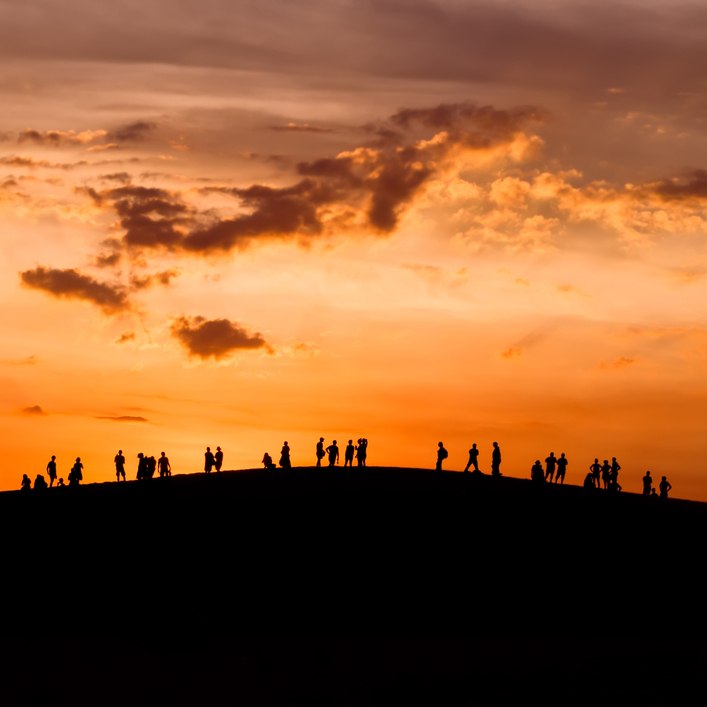 “Of the best leaders,” continues the Tao Te Ching, “when the task is accomplished, the people will remark: We have done it ourselves.” Isn’t that the type of team you’d love to give your heart to? I suggest that’s a team with not a single leader – it’s full of the best leaders, and served by at least one engager. Can you think of any current or historical examples of engagership? Have you ever experienced it? Let us know in the comments section!